We sell PT Coupling fittings because they use an extensive array of materials for cam and groove couplings, with selection depending on the intended application. PT cam and groove couplings are assembled with solid pins. 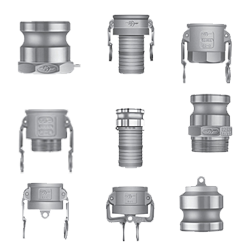 PT Fittings offer superior pressure ratings that surpass industry standards. Also available is exclusive STA LOK®. A positive locking cam & groove feature and the STA LOK®II is a passive locking cam & groove.